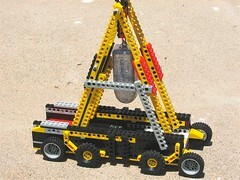 Make a trebuchet (mostly) out of lego, capable of launching small objects like acorns or minature marshmallows over thirty feet. It’s a geeky ABS cousin to the PVC Marshmallow shooter, and you can build one yourself. The trebuchet consists of several parts: A sturdy base with wheels, a movable arm with a counterweight, and a flexible sling with cords on either end. Obviously, it’s got more wheels that it needs– and yet, they somehow seemed appropriate. The base of the trebuchet needs to be extremely strong to support the axle and withstand the high forces that are generated in the launch. The design is based around a pair of heavily reinforced A-frames, and it performs quite well. You can zoom into the pictures to get a better look. The weakest aspect is that there is (presently) no good bracing against out-of-plane motion of the counterweight. While it is certainly possible to add struts to make it stronger, they tend to get in the way of actually operating the trebuchet. 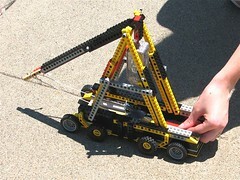 By sliding the axle, the arm and counterweight of the trebuchet can be removed to work on either the arm or the base. A couple of non-Lego items used here: A three-pound (!) 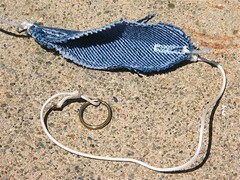 lead fishing weight, and a loop of copper wire to attach it to the arm. The sling was sewn from denim scraps with buttonholes added to tie onto the lines. While this is arguably the best way to make your slings, you can just get your scissors and tape and use whatever’s lying around– leather, plastic, a t-shirt, or a tyvek envelope. 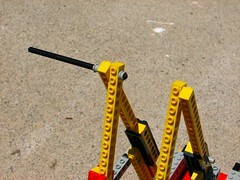 The “hook” on this version of the trebuchet is just a straight, beige lego strut. Using a slightly curved piece gives a different launch angle, but this straight piece works surprisingly well. The ring came off of my key chain, and the cord is the thin type used for adjusting window blinds. 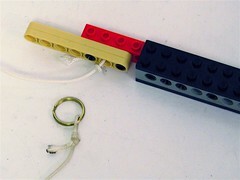 To load the sling, just place your ammo in the center and fold the ends together. Once the sling is loaded, it can be pulled down through the body of the trebuchet. This also pulls the arm down, which raises the weight to its highest position and effectively arms the trebuchet. Hold the sling by hand until you’re ready to release it. Shooting the trebuchet is as easy as letting go. 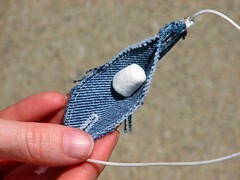 The weight begins to fall, which whips the sling around and launches the marshmallow. In the photo on the left, the sling has just been released, and (if you zoom in) you can see the motion blur at the end of the arm. 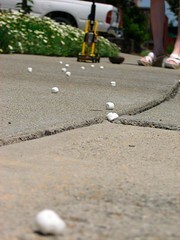 The photo on the right shows the trebuchet in action, just before the marshmallow is released. If you look closely, you can see that the ring has *just* slipped off of the hook. Moments later, the marshmallow is in full flight. 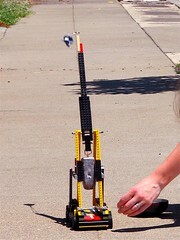 With a little practice you can shoot small objects over thirty feet with this setup. Here you can see part of the trail of marshmallows on our sidewalk. You can, of course, make larger and smaller trebuchets, but this just might be a good place to get started. 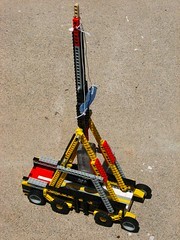 Our little Lego trebuchet (Leguchet?) made its unofficial (secret, actually) debut at Maker Faire last year. I took it along because we were in the same room with all the amazing lego creations, which provided a pretty good target– and they didn’t seem to mind =). Finally, a word of caution: With the three-pound fishing weight, the arm really moves. You can poke an eye out if you aren’t careful, so watch what you’re doing, and don’t let anyone stand over the trebuchet once the arm is pulled down. The Hungry Scientist Cookbook, forthcoming from ReganBooks at HarperCollins in September, 2007. 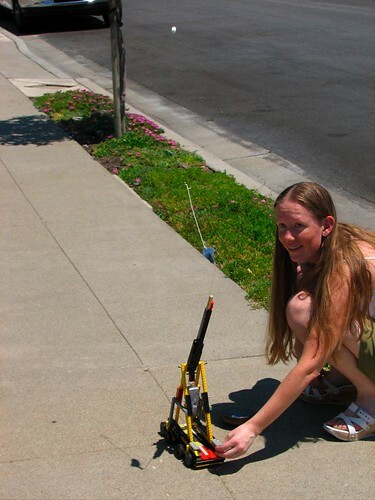 Until then, you can hang out with the Hungry Scientists in their group on instructables. 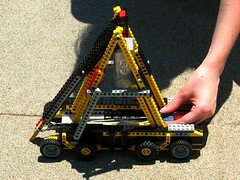 This entry was posted in EMSL Projects and tagged diy, lego. Bookmark the Permalink. Neat! I was there at Maker Faire (I took the crane pic you linked to), but unfortunately didn’t manage to spot your trebuchet. 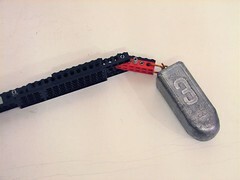 The lead weight and the marshmallow ammo are both good ideas. 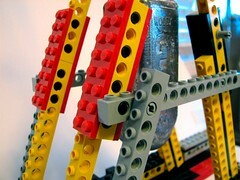 I built a Lego trebuchet a couple of years ago, but with a sliding pivot point. I was never able to figure out how to make a good sling for it, though. Cool! That crane has got to be the most awesome lego machine I’ve ever seen. We were there, stationed right across from the crane with our Interactive LED Dining table. The lead fishing weight you used as counterweight is 3 ounces, not 3 pounds. Cool idea! No, that’s three pounds all right– it’s seriously heavy. Yep, those lead sinkers are quite effective when it comes to putting a lot of mass in a small area.